GKH is pleased to announce that Julie M. Slabinski has joined the firm as an associate attorney practicing in the areas of general litigation and real estate, zoning & land use. Julie holds a bachelor’s degree in English from Penn State University and a law degree from Widener University Commonwealth Law School. She was awarded the Outstanding Service Award for her distinguished service to the legal community during law school. 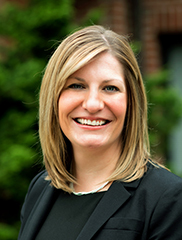 Most recently Julie worked for a Philadelphia-based litigation firm where she focused her practice on the defense of casualty matters, including commercial transportation, premises, and products liability cases. Prior to that, she served as an assistant district attorney with the Lancaster County Office of the District Attorney, where she represented the Commonwealth in a variety of criminal trials and hearings before judges and juries. Julie is a Lancaster County native and a graduate of Donegal High School. She lives in Manheim Township with her husband and two sons. In her free time, she volunteers for the Junior League of Lancaster and enjoys spending time with her family. We are delighted to welcome Julie to the GKH team!